We created the wonderful (not really) piece of art you see to the left back in June of 2012, for a reason. 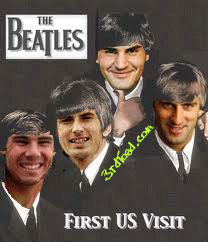 You basically had these guys, the Fab Four, hanging out in the top four spots of the ATP Tour Rankings. Well, we are nearing three years later and who is at the top of the elite heap again? These same guys. I would like to stay still, but a few guys have left the top floor to go on holiday (understandably so), but not far and not for long. For the rest of the pack it's not like playing King of the Mountain, it's Kings of the Mountain. Yes, Wawrinka and Ferrer have had their runs, but it's almost as if the fabulous fourth looks over his shoulder as he's leaving and says, "Guys I need some time away. I'll see you in a few months." Later, that fabulous fourth comes crawling back over the other guys clawing at one another at the base of the mountain and takes his seat aside the other three. "Hey guys. What's up? How's it been?" If this goes on for a few more years they will have been together longer than The Beatles.